- Team Japan is ready to win!! Karsten Feldborg (DEN) - Kunihiko Tanida (JPN). I met Ben Seeley 2003 in Stockholm. Ben stayed at my home for almost 2 weeks. It was fun and we got to know each other well. Next time, 2004 when he visited before WOC in London, we saw cinema together and did a lot of fun things. Since then Ben has all those years been a person I sometimes contact to ask about Othello-related tournament questions. Often he does not agree with me and that is one of the best aspects with Ben, we can openly discuss with great respect for the other's ideas and thoughts. When people ask me about Ben as a person and Worldchampion I can only give one answer, Ben is Ben. When he decided to become Worldchampion he worked hard to achieve that goal, it meant many hours of hard work on strategy study and game play. I am happy he chose Stockholm 2013 for his comeback. > Comeback! Wow! Why WOC Stockholm? Is that because you won 2003 or any other reasons? That was one reason. I also wanted to try tournaments again, and see how I would do. I also miss the Othello community. As Suekuni put it, Othello is his "hometown", and so he would never leave it, and I feel a lot that way, too, especially after my absence. I missed being a part of the action. > USA team: three WOC champions. Not so bad at all! You, Kunihiko Tanida and Brian Rose. Do you feel that USA team haa a chance to win the hropy? Do you think all or some have a chance to go to the semifinal? Yes, we definitely have a chance to fight for the team trophy. That is one reason Brian Rose is playing this year- to try and win the team trophy, and it's one reason why I tried to convince Brian to play in the last qualifying tournament! I think that Tanida was in very good shape in NYC, and Brian is training hard, and I feel fine. I think if we can do our normal best, each of us has a chance to be in the semifinals. Tanida also won in Stockholm, and I hope we will both have good luck again! > Team Japan. Last year they took place 1-3 and runner up female and won the team thropy. What do you think of the 2013 Japanese team. Kazuki Okamoto and two more "unknown" players? Okamoto's performance in OWC 2013 was incredibly inspiring to me. 15 wins in a row, against such strong competition, is amazingly impressive. I particularly enjoy his style of play, among the new top players. It reminds me of how I used to play, when I was younger. I was rooting for him to go all the way, but sadly he got bad luck at the end. Unfortunately for the rest of us, I fear that maybe he is very hungry to win the WOC, as revenge for the OWC! Yamakawa is not unknown to me... I have actually played him OTB, in 2005! We played at Murakami's Dojo, the Othello "summer camp" Murakami has run. At that time I could get a big win, but even then, it was obvious that he was a very smart and creative player who thought through his moves quite well. Also, I knew Yamakawa's nickname online for many years ... we have played hundreds of games before. 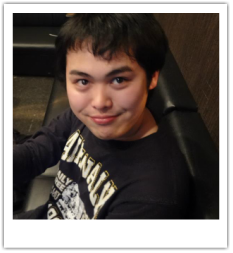 I think Yamakawa is an extremely intelligent person, and I enjoy talking with him, as well as playing him. I know Miyazaki the least... but I've still played him many times online, over the years. He is clearly quite strong, too. Actually, altogether, I've probably played 1000-2000 blitz games with the players on the Japanese team, over the years. Maybe they seem unknown to others, but to me they are familiar opponents I've known as being strong, for a very long time now. > What do you think about the new generation of Japanese players,Takanashi, Ito, Okamoto, Yamanaka and more less wellknown. Also .. .where is the new generation in USA and Europe? The top players are still Biggelaar, Kashiwabara, Borassi, Seeley, Rose .... Ok ... some of them are still young ... :-) but as Othelloplayers old. Except Arthur Juigner, Switzerland, where is the new generation? America has at least a few new players, who I think could have a bright future in Othello- Jerry Hai, Richie Gilliland, and Paul Curran, who unfortunately lives in Alaska, far from any tournaments. > What can we do to get a new good generation of players in the rest of the world? Why are the Japanese so strong? Is it because they are many? Or genetic? Or that they have major tournaments once a month? I think the biggest problem is that it is hard for any starting players to find PlayOK or any other game site with top players, and to find out about tournaments, etc. There used to be more game sites which could get new players from the general public interested in the game. The more ways random people can get introduced to the game (by buying a board or finding a game site) *and* become aware that there are tournaments and informational resources available to them, the better. Japan has a good system for this, I think.. lots of exposure for the general public, and a high level of awareness that there are tournaments, learning resources, etc. > Except Othello, what are you doing with your life? Surfing and listen to Beach boys and look at surfergirls? Or something more fun/important? No, you pretty much have it right :). I timed it so that my last day of work was yesterday, and now I plan to have a few weeks with lots of fun- going to the beach, writing, traveling, visiting friends, and of course the WOC! After I return from the WOC, I will have to get serious again :(. I hope to start blogging again, at some point in the next couple of months, for fun and other reasons- both Othello blogging, and other blogging as well. > Ah .. Sweden .. .is it anything you wish there? Any favourite food you want to eat when you arrive? I love Sweden! I want to eat caviar from a tube, and also make many types of smordbrod... I think all the seafood in Sweden is quite good, and food in general is good there :). At least for my stomach it is very satisfying- even Swedish pizza! I think maybe the Swedish and the Japanese diets are best for me :). So, the WOC in Stockholm is my perfect environment ~~. I also hope to spend a lot of time among Swedish islands... which I think I will get to do, and also spend time among all types of Swedish nature, which is very beautiful to me. But, the best thing in Sweden is the people :). I want to spend lots of time with friends there. Not least of all you, dear Benkt! I hope you will have lots of fun hosting this year's WOC... I was surprised you ever did it again, after how hard you worked on the last WOC in Sweden! All women players in the USA have declined their invitations, so the USA will be sending only three players. Now this is a fabulous team with 3 former World Othello Champions! I look forward to see them in action at the WOC in Stockholm. > Hello Katie and Lari, good to see you. Katie you recently moved from Hong Kong to Åland. hows life ? adjusting easily ? Katie : Yeah, Åland is a very nice place. I am learning Swedish. > I thought you moved to Finland. Lari : They speak Swedish here, but it is part of Finland. > So how did you two meet ? Was it love at the first flip ? Katie : We met in Finland, before WOC Iceland in 2005 and then in Iceland we followed each other around a lot. > What is the best place to compete and improve your Othello skills? Europe or Asia ? Katie : In a place like Hong Kong, it is very easy to meet up with other Othello players, but in Europe there are more interesting tourneys. Lari : I agree, not too easy to arrange Othello meeting in Europe. Lari : In Thailand Othello is quite big, many tourneys and meetings in Bangkok and ofcouse, Othello in Japan is very special. Lari : In Finland we only get a few people together for 1 tourney a year, and even that is hard. > Is it true Katie that you had a Japanese player as mentor ? Katie : Yes! Kenta Tominaga ! Though we are not in touch anymore, but he did coach me at Internet Othello Server (IOS) years ago, such a nice guy. > Care to share how you met Kenta? I remember he won the Meijin and All Japan in 1999 right ? how did you two communicate ? Katie : English mostly, and very very very little Japanese, I studied Japanese for some time so I know a little basic. We met on IOS and just started chatting some, I was really enthusiast about Othello back then and always wanted to play with him, he was ofcourse much better and kept defeating me. He was patient and willing to spend time with a weak player like me, I was very thankful for that and I have been a fan of his since then! Too bad I wasn't there when he won the World Championship in Athens in 2007. > Lari, though you had only played Othello for 2-3 years, you got 8.5 wins at 2003 WOC in Stockholm. > It is not hard to accept a victory, but only a few can adapt to defeat. Is this mental aspect very important in a tournament such as the WOC? Katie : Sadly I am quite accustomed to losing, it doesn't make me feel bad at all, except if the loss was due to very stupid mistakes I made. One time I cried after a lost game. 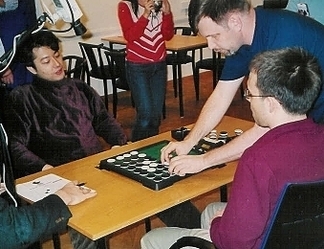 It was at The Othello World Cup in Japan, after I lost to Takuji Kashiwabara. I had a very obvious win in the last 2-4 empties, then I just somehow made the wrong move. I just blamed myself so much. > Was it time pressure ? Katie : I had enough time and I had the endgame planned out..just suddenly lost my senses, then I played very badly after that..
> How do you plan to prepare for this year World Championship? Lari : I have actually played a lot and know some book too this year, some book I actually will get to use unlike the years before when I had tourney openers but only got to use them once. > Katie you just said the magic word "GHENT". 2009 woc first day, 2013 EGP Ghent. Ghent seems to bring out the best in you. Katie : I definitely performed better than I expected.. but I do believe many players I defeated in Ghent are normally better than me, just it was the timing that caused the miracle. > No you are always strong. It was a tough tournament, with Nicky van den Biggelaar, Takuji Kashiwabara, Marc Tastet, Martin Odegard, Arnaud Delaunay and Francesco Marconi. Katie : Thank you, when I play well, I am quite ok, but my game has it’s ups and downs. Funny, Lari is not on your list of strong players lol. Katie : He beats me 4 out of 5 times when we play on-the-board at home.. (but we played only after EGP Ghent. Before that, he didn't think I was worthy of his time). Lari : jah, Katie not too strong to play against at home. > Katie, you were the first woman to win a European Grand Prix tournament, that was quite an achievement in a tournament filled with lots of strong world class players. Does this mean you are closing the gender gap ? Do you notice any difference when playing a man or a woman ? Katie : I think the gender gap is mainly due to the difference in the number of dedicated players in the two groups. I don't think I am influential enough to be closing the gap. Mmmm, I have never thought about it, so I guess I don't notice any difference between playing a male or a female player. > Bengt Steentoft predicts that you could be the first female player to make it to the semifinal this year, what do you think about that ? Katie : That's very flattering. I will have to do exceptionally well to make it possible. I tend to play bad when under stress so I don't have high hopes for myself at all. > ok, if you had to play against each other in WOC, who would win ? or will you play a draw line ? Katie : I don’t know any draw line and we will try our best to beat each other. Lari : we don't know any draw lines lol, I don't think either of us knows a full book of anything. In any situation I will try to wipe Katie. > One special last question for Lari. Imagine you made it to the final of the WOC, it’s the third and final game. Your opponent plays an opening that you know by heart. You memorised it 60 moves deep, your opponent is quite death. You still have about 20 minutes left. What do you do ? Pretend to think so the audience thinks you can see 20 moves ahead ? Lari : as I said earlier, I don't remember any openings that deep. I don't use Instagram and I don't like to waste time; total defeat in 1 min ! > hahahahaha well done Larry and thank you Lari and Katie for you time. 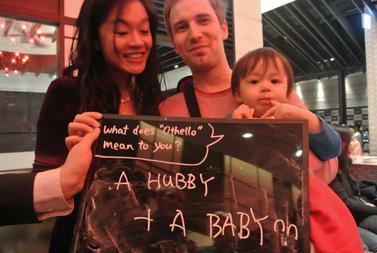 You both are so lovely and fun and add color to our Othello community. I wish you two all the best for 2013 WOC. And please if someone could help Lari and Katie babysitting Coby during their games in WOC, please contact them. Thank You. 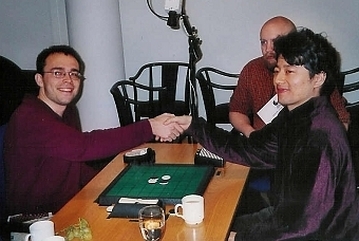 > Hi Martin, we met earlier this year at the Othello World Cup in Tokyo. 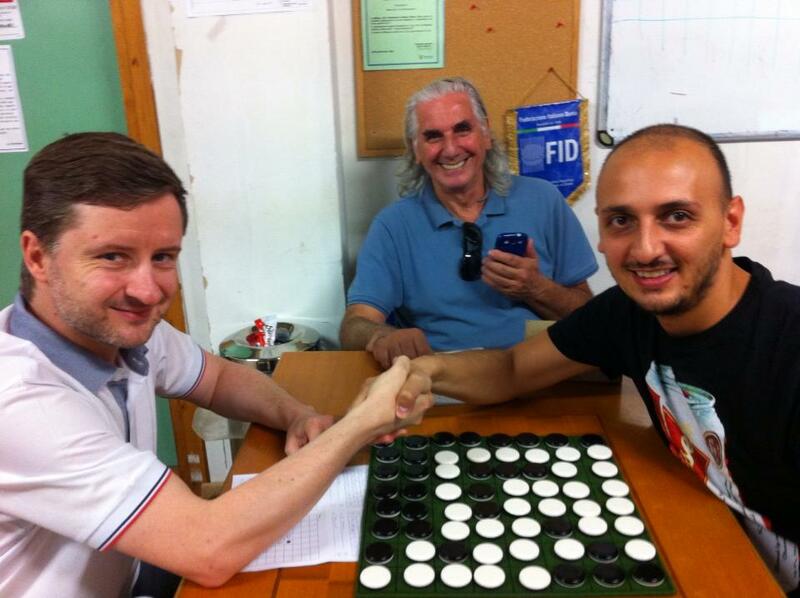 > Will you play at the World Championship Othello 2013 in Stockholm? > What do you do for a living? > You follow the footsteps of Graham Brightwell, Takuji Kashiwabara, Imre Leader and Aubrey de Grey. > When did you start to play Othello? I started online in 2005. My first tournament was the Norwegian Championship in 2006, where I ended 3rd. > Nice result for a first timer, but I bet you were already good online before you entered the tournament? Yes, I already met some of the other Norwegians online, and knew I was at the same level, at least online. > I knew some Norwegian players that I met long time ago. Do you know Alex Boe and Jan Haughland? Yes, I have played them many times, and they both played Norwegian championship last month. > Our community is not so big and we always meet the same players and become like family. Do you have best friends in the Othello world ? 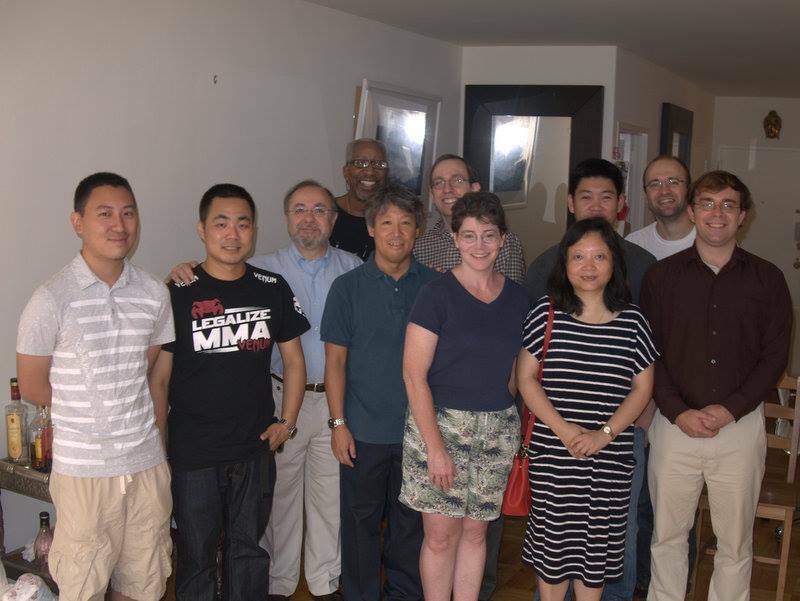 I have played all WOCs since 2007, and made some good friends in the Othello world, even though we only meet once a year. For example, I was on vacation in Thailand two years ago, and met Piamrat and Piyanat and some other players in Bangkok. Ah yes the Thais are very nice. > Some say that Othello is the way of life, meaning that your playing style or the way you play are the reflection of your life, is it true ? If yes then what is your way of life? This is one thing I love about othello, that there are different styles of play, and you should master all of them to be an expert. My style tends to be very focused on tempo, and I often make sacrifices to gain advantages later in the game. Maybe my way of life is the same. > That's a very good philosophy, is this why you are not afraid to play X-squares early in the game? Exactly, X-squares is a good example of a way to sacrifice discs and gain tempo. > I remember your game against Yusuke Takanashi at WOC 2012, would you care to share your thoughts on that game, because you went to X-square quite early if I remember correctly. In that game, I played an X-square quite early, that is true. The problem with this style of play, is that you can have many options in late midgame, and it can be hard to decide where to play. In that particular game, Yusuke gave me a lesson of how to get stable discs as black player without parity or tempo advantage. > Martin, I've been following lots of your games lately, I must say I’m a fan of your style. I think from a technical point of view you are on par with the crème de la crème of the Othello world. What do you think is the missing ingredient for you to win one of the major tournaments ? One thing is the experience of playing finals, as you may know I have lost 4/4 finals this year, (note: EGP Prague, EGP Ghent, Cambridge Open and Norwegian Championship) and I should also improve my skills at endgame counting. > You've been to WOC, OWC and Meijin. Is there any difference? 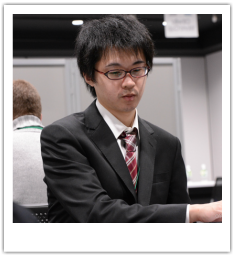 I played WOC 2007-2012, OWC 2013 and Meijin 2008 & 2012. I think all of them are World Class tournaments. Meijin is only one day, so you can not afford to lose a game if you want to be the champion. WOC is the tournament where most nations are represented. I have enjoyed all these tournaments. > Maybe one last question. Lot of girls say you are the sexiest Othello player alive. What do you think about this title and maybe some words for your female fans? I appreciate this title, even though it must be highly unofficial. My fans are the best! 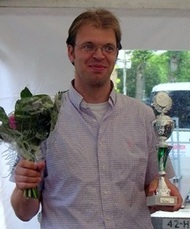 > Thanks for the interview Martin and good luck at the World Othello Championship. > When and why did you start to play Othello? What is your goal for Othello? Kazuki O.: When I was nine years old, there was Othello class in the neighborhood, so I started to play Othello. My goal is to be world champion. Takashi Y.: I started to play othello in 2002 when I entered Azabu junior high school where Takeshi Murakami is working. There is an othello club in the school and I practised there. My goal is to be the world champion. Yoko S.: I met Othello game when one of the elementary school years , I was having fun and the Othello in class follow all the classroom of school ! Othello board was handmade ones of course !And I was beginning to Othello tournament in earnest into the book Othello Federation in 1990 . > Last year team Japan was placed 1-3 and also won the Team Throphy. Only 1 player from that great team returns to the WOC this year, Kazuki Okamoto, but we feel the Japanese team is again very strong. What are your goals this year? Can it be as successful as last year? Kazuki O.: Our goal this year is to win the Team trophy, and place 1-3! It is the same as last year. The result of last year was the best. Takashi Y.: Of course, I aim to win both individual and team competitions. At least I want to win the team competition because Japan team is winning the team champion 8 years in a row and I don't want to stop it. 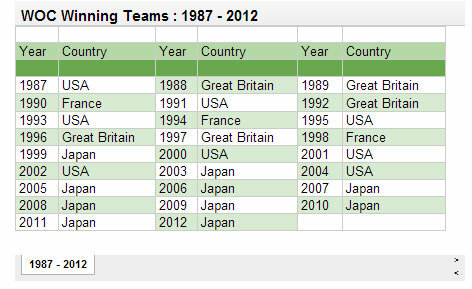 I think this year Japan team is as strong as recent Japan teams, and we can make it. Yoko S.: Team championship this year I do not know which one will win, the United States or Japan . > Team USA has two comeback players: Ben Seeley and Brian Rose. 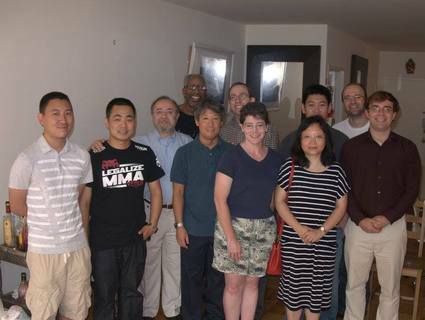 Together with Kunihiko Tanida the USA team seems to be a formidable opponent. What is your reaction to Seeley's and Rose's comeback? Kazuki O.:I have never played against Ben Seeley. So I want to play. I think Ben Seeley is perfect in the opening, middle game, and end game. 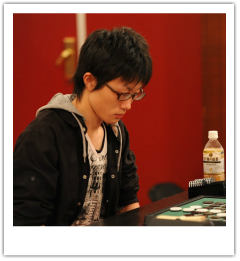 Takashi Y.: I have played with Brian Rose in Japanese tournament a few times, so I know his playing style to a certain degree. I have never played against Ben Seeley in a tournament, so I'm looking forward to playing with him. I know all players of USA team are very strong and they would be a rival for the team trophy. Yoko S.: I think that it would be great . In recent years Ben you had retired I think best member of the United States and has been established for just this year because Brian Rose had retired as well. > It is well known that there is a new generation of players in Japan. Takanashi, Okamoto, Ito, and now two, for Europeans unknown players, Miyazaki and Yamakawa. Players like Tamenori, Suekuni, Nakajima, who are famous worldwide, did not qualify for the Japanese team. How good is that new generation? And why are there so many excellent "younger" players at this moment? Kazuki O.: NEW generation study opening very hard. So I think NEW generation is good for that reason. Takashi Y.: With the spread of the internet, many players started to play othello online. Moreover, many tournaments are held frequently in Japan, and so players who start to play on the internet can easily go to tournament and improve their skills. This is the reason why there are many "new" strong players. Yoko S.: It has improved the ability to work hard you have a tournament somewhere almost every week in Japan . I think he is in the brain of Japanese " think things over ! " This thing . > Stockholm. Sweden. What do you guys know about this place? And what do you want to know? Kazuki O.: Sweden.I think it is very cold. I want to sightseeing the famous place. Takashi Y.: I know little about Stockholm except that it may be cold. The venue seems to be very nice place. I want to know some sightseeing spots. Yoko S.: I also want to tourism if there is time very good place Stockholm . > Kunihiko Tanida won WOC 1982 in Stockholm. Ben Seeley won WOC 2003 in Stockholm. Who will win this year? Takashi Y.: I want to win. Yoko S.: I do not know who will be the champion, this year is a powerhouse set. Almost 2 weeks ago Trees asked me to write something for the upcoming World Othello Championships and the Dutch team. Of course I said “Yes”. I knew already that I would find it hard to actually keep my promise. Here goes. For most Othello players, qualifying for the World Othello Championships is --hard as it is-- a goal in itself. Quite a few countries have 3 or more players that have played at the WOC before, which makes it hard to qualify each and every year. In the Netherlands we have the same ‘problem’. It starts with Nicky van den Biggelaar. The past 9 years he has claimed the #1 spot in the Dutch Grand Prix’s. And has done so again this year. So, basically, the rest of the players may fight for spots #2 and #3. This year, Roel Hobo took spot #2 convincingly. The third spot would be decided based on a final showdown between Erwin van den Berg, Jan de Graaf, Sido Helmes and Martin Fransen (Albert Kortendijk and Patrick Aubroeck, both having played several WOC’s waived the opportunity to qualify this year). Erwin won having 4 wins and 223 discs (21 discs more than Sido Helmes who also had 4 wins). Erwin is a debutant on this year’s WOC. He is a big guy. Big physically, likely going to the gym more often than most of us, but also pretty big in Othello. He has played a few EGP’s and scored very well in some of them. Erwin enjoys playing relatively unknown openings and is scaringly good at it. I am convinced he will enjoy himself, take a few unexpected scalps and score 7+ wins. Go Erwin! Roel has played several WOC’s and many dozens of EGP’s. He is truly a solid and constant player. When he is focused (…basically always?...) he is to be feared. In my view Roel’s biggest strength is being able to find good moves when the opponent thinks there are none. This includes setting devious traps. 7+ wins for Roel too. Go Roel! She is very modest about it herself but she IS a former female World Champion! 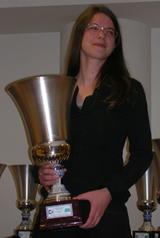 Perhaps several players in the Dutch Othello community are more excited with her having won the 2010 WOC than she is herself. I know I was very excited. She doesn’t practise really hard, but if she plays occasionally she just gets better and better. She has beaten many top players during the years and surely will ‘sink’ a few of them this year. 7+ wins, a playoff and a spot in the final… Go Jiska! Those of us who remember the photo on the left know what a neat, fun kid he was and what a nice guy he is now. And how he keeps amazing most of us with his playing quality. 10+ wins for Nicky. Go Nicky! 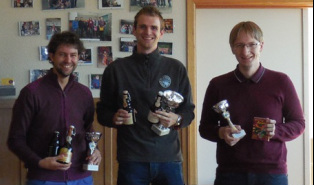 Belgium will send a team of three players to the World Othello Championship.Tom Schotte (middle) will be the delegation leader as Belgian champion 2013. It will be his 9th appearance at this highest level Othello tournament. A 12th place was his best achievement (Ghent 2009) at a WOC. Nick Reunes (right) and Michael May (left) earned their qualification based on their second and third place in the Belgian Grand Prix. 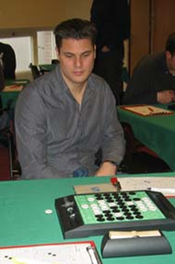 Nick Reunes will play his third World Othello Championship after appearances in Ghent 2009 (62nd) and Athens 2007 (60th). 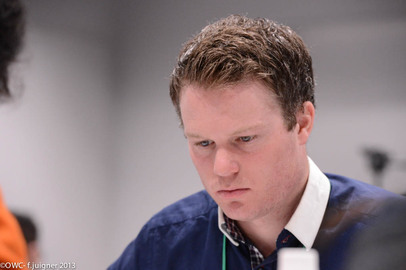 Michael May became 64th in the 2012 World Othello Championship in Leeuwarden, The Netherlands. Unfortunately Belgium will not be represented by any women as all of them declined the invitation (due to work) or did not reply to the invitation. We wish team Belgium the best of luck! A union of tradition and innovation, a proportion of experience and innovation, a mix of maturity and modernity. That's the Italian Othello team that will participate in the next WOC in Stockholm. Michele Borassi is a player who really does not need an introduction. He became World Champion in 2008, in Oslo, not far from Stockholm. He was runner up of the 2010 edition. He has all the possibilities to get to the semi-finals and, the Italian Othello players hope, to compete for the title of World Champion. His style of playing is well known and, of course, well studied by his opponents. A great knowledge of the openings, a solid mid-game and a great endgame makes him a player who can compete with the best world players in every part of a match. Michele was Italian champion of mathematics four years ago. He got his degree this year at the "Scuola Normale Superiore di Pisa, the most important Italian university, with a thesis that received great appreciation from the mathematical academic world. No need to further explain his talent for logical thinking. Francesco Marconi is one of the oldest players of this edition. 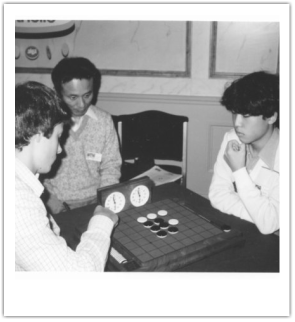 He started to play in the 1987 WOC, when Othello strategy still was at its beginning, when studying openings still was a hard-fought question, when the use of computers had only just started. His best result at a WOC is a third place at the 1992 edition, in Barcelona, and he finished 5th at WOC 1988 and 1999. This year he ended second at the European EGP after a fantastic fight against Takuji Kashiwabara that was decided at the last tournament in Paris. It shows how he was able to adapt himself to the change of times, to the introduction of computers that forced him to change his style of studying and play. He claims he received the Italian creativity from his father and the Croatian obstinacy from his mother, qualities that he often shows in his on the board games. IT expert, he works for the Italian parliament and he likes competition. He aims to do well at the WOC. 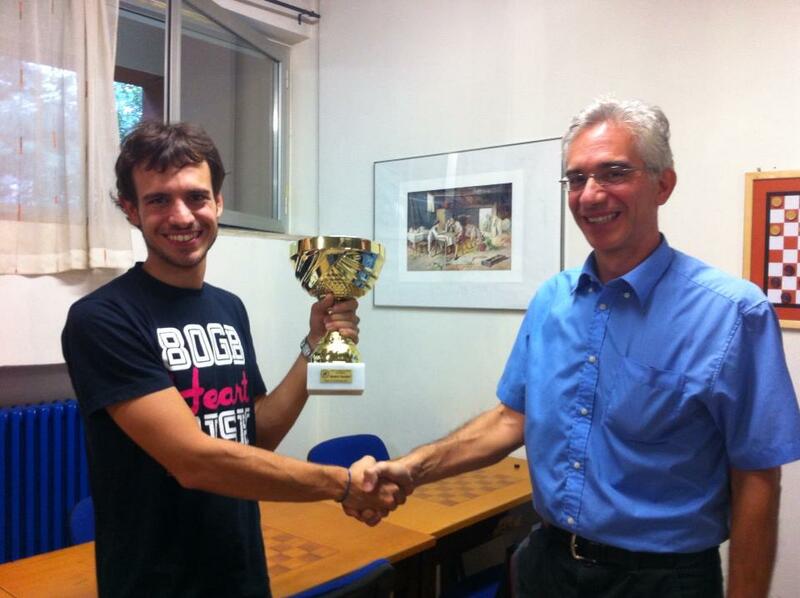 The third team member, Gianluca Ilacqua, is a new player at the international competition. He started to play three years ago and quickly joined a good level earning this year the title of Italian master and getting the qualification to the WOC. It’s his first participation in this competition, but he has all the cards to have a good result. He works for a private company as accountant. Surely he won’t have problems in counting the finals!!! The Othello News editor has lately played 11 games against him online and lost 10. Maybe a rematch in Stockholm?